Figure 7-4. 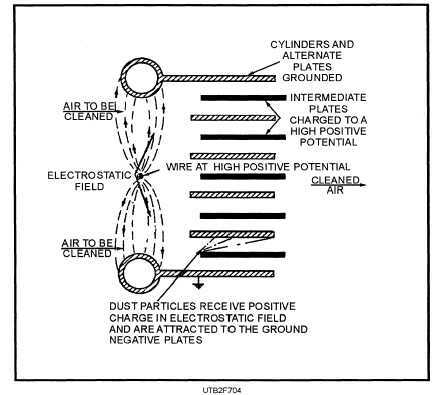 - Diagram of an electrostatic filter. Q6. What condition exists when the dry-bulb, wet-bulb, and dew-point temperatures are the same? Q7. What are the two types of filter designs? Q8. What is the primary factor that determines the temperature and humidity required for room comfort? Learning Objective: Recognize basic types of air-conditioning systems, and understand the operation, maintenance, and repair methods and procedures. A complete air-conditioning system includes a means of refrigeration, one or more heat transfer units, air filters, a means of air distribution, an arrangement for piping the refrigerant and heating medium, and controls to regulate the proper capacity of these components. In addition, the application and design requirements that an air-conditioning system must meet make it necessary to arrange some of these components to condition the air in a certain sequence. For example, an installation that requires re-heating of the conditioned air must be arranged with the re-heating coil on the downstream side of the dehumidifying coil; otherwise, re-heating of the cooled and dehumidified air is impossible. There has been a tendency by many designers to classify an air-conditioning system by referring to one of its components. For example, the air-conditioning system in a building may include a dual duct arrangement to distribute the conditioned air; therefore, it is then referred to as a dual duct system. This classification makes no reference to the type of refrigeration, the piping arrangement, or the type of controls. An air-conditioning unit is understood to consist of a heat transfer surface for heating and cooling, a fan for air circulation, and a means of cleaning the air, motor, drive, and casing. A self-contained air-conditioning unit is understood to be an air-conditioning unit that is complete with compressor, condenser, evaporator, controls, and casing.